Russell J. Lanthorne Jr. taught math for nearly 20 years and from 1967-1979 coached the La Jolla High School boys’ tennis team. His tennis teams won ten consecutive San Diego CIF team championships from 1970-1979, establishing a national record of 185 consecutive wins. During his years at La Jolla High School, the Vikings posted a 254-7 record. 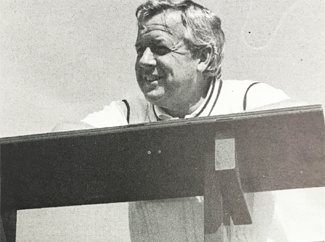 In 1979, Russ was selected Tennis Coach of the Year for the nine western states, and was a finalist for national Coach of the Year honors. Additionally, 43 of his players were awarded collegiate tennis scholarships. Russ Lanthorne of La Jolla passed away November 15, 2013, at the age of 86.